In 2000, Jean Giraud decided to stop smoking marijuana. 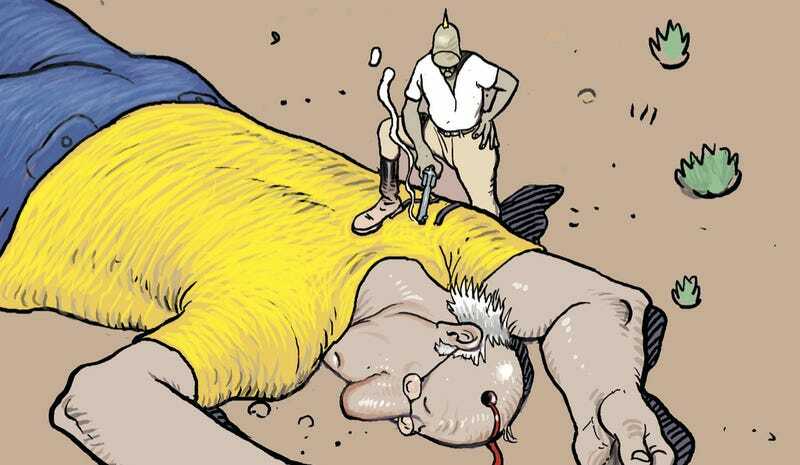 Internationally renowned for his work in comics and film—most of it under the pseudonym Moebius—he gave up the drug to strengthen his determination, and started an introspective diary comic to chronicle his mental state during this major life change. Inside Moebius: Part I (Dark Horse) begins with the author fixated on his relationship with the drug, opening on a two-page spread detailing the first lesson: “smoking does not improve the art.” The cartoonist draws himself on his stomach, helpless under the heel of his own creation, Major Grubert of The Airtight Garage, and the image succinctly summarizes Giraud’s struggle at this starting point. He’s being crushed under the weight of his past. His drug habit is part of the pressure, but so are the stories that built his reputation and the expectations and dreams of his younger self. He confronts them all in these pages, and the longer he goes without smoking, the deeper he goes into his anxieties and fears. Those are initially tied to his creative output, but as the diary progresses, he starts to worry about the world at large. The events of September 11, 2001 have a huge impact on Giraud, and they inspire him to start pondering human nature, geopolitical conflict, and religious oppression via his popular characters like the Major, his companion Malvina, Blueberry, Geronimo, and Arzak, who are joined by Osama Bin Laden in the second chapter. Giraud spends a lot of time with this fictionalized interpretation of the terrorist leader, trying to figure out what drives a person to commit such atrocities. Giraud acknowledges that this section goes on too long, and yet he can’t pull himself away. He knows he’s not creating material with much commercial appeal, and while he feels the temptation to get back to the stories that will actually bring in money, he can’t continue with those projects until he works through his personal blocks. He can’t control where this journey takes him, and a big part of the process is trusting his instincts to guide him. He’s not working from a script and skips preliminary pencils, starting with ink on the page and accepting that it’s not going to be as tight. Acceptance is at the core of Inside Moebius. He cannot break through his limits until he recognizes that they exist, and this diary is artistic therapy that leads him to the next stage of his creative evolution. Dark Horse’s hardcover edition—the first of three coming out this year—features a selection of notes from translator Diana Schutz, who breaks down the challenges of what she does and reveals instances when the French wordplay is impossible to translate. The character’s wander around “Desert B,” which in France is pronounced the same way as the verb décherber, meaning “to weed,” as in a garden. That clever connection would be lost to many English-language readers, and the translation notes are a welcome bonus feature that enlightens the cartoonist’s original intent. Readers looking for a traditional plot with a beginning, middle, and end won’t find it in these pages, but there’s a compelling story here about the ongoing challenges of being an artist and finding ways to be inspired when creation is your profession.